Here are some quotes that made me think about weightloss. They can be generalized for any situation in life, but they sparked my thoughts about you. 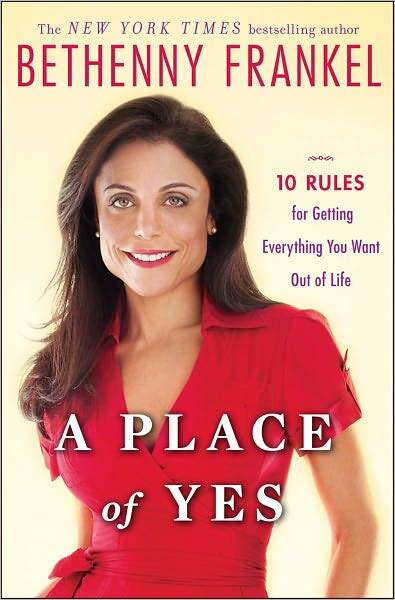 They’re from A Place of Yes by Bethenny Frankel. (I haven’t finished the book yet, but was inspired to share this with you.) More posts to come! Did you have a recent set-back? If you fail to plan, you plan to fail. We must always keep in mind and have a plan of what to do, if things don’t go our way, and what to do when that happens. We’re human. We have to be real with ourselves. Don’t lie to yourself. Be honest. If you know yourself well enough, and can examine your history, make sure you make a plan for what you usually fail at. This doesn’t guarantee you will do the same mistakes you always do, but you will have a back-up plan, just in case. Now…so many days later… you fail. Read below to figure it out. Figure out why you did what you did, you’ll be less likely to make the same mistake again. Why did you do it? Why did you eat that cookie, ice cream, pizza, and cheeseburger? Why did you pig out before bed, during that movie, or at that work party? Was someone pushing you? Were you not disciplined enough with yourself? Did you feel out of control? Answer these questions so you won’t make the same mistake again. Every crisis is an opportunity for self-examination. Examine yourself. Re-examine. Don’t just make statements. Truly take a moment to examine your actions and why you got the result you did. Instead of beating yourself up about it, figure out why it happened. Beating yourself up will do nothing to take you to success. It will actually take you even further back into that mess. You will feel less secure, think you can’t do it, and continue on that path of mistakes. Instead, figure it out logically, like a math problem, and find a solution. Often, you will discover what’s true after making a mistake. What is true about your situation? What is false? The people around you will always want you to do what they want. That’s human nature. Unless you know what you want, you’ll be making decisions and living your life on somebody else’s terms. Just because your best friend, spouse, parents, or boyfriend is eating pizza and watching Netflix when you get home does not mean you have to join him! Get your workout in, make a healthy meal, and put yourself first. They will slowly start to understand and may even decide to join you. It can take a few swings of the axe before you actually sever the links. You may not succeed the first time, but try, try again. You will get the hang of it. And for each fail, you will learn something more. You will take that lesson and knowledge into your journey, and do better the next round. Something punch you down? Now you know how to block that punch. To have a future, you have to let the past be past. If you keep doing what you’ve always done…life will be the same. Leave your bad habits, eating connections, and emotional boundaries in the past. Let. It. Go. And you will be able to grow. Make your pain your identity, then that’s what you become. You become what you think. Your thoughts are who you are. If you think you are a sad, fat, depressed, troubled person -then that is what you will become and stay. Start thinking of what you want to be. A strong-willed, disciplined, fit and healthy, woman. A fun person. An active person. A person who loves hiking, skiing, running, dancing, socializing, -whatever floats your boat. Imagine the person you want to be and keep that image in your head. That is what you will become.